For some time, the Islamophobes have been trying to create a negative image of Islam. They badmouth about our Prophet Muhammad (Peace be upon him) and the holy Qur’an. They have been trying their best to misguide people. They fabricate lies and attack on our beloved Muhammad (peace be upon him). Therefore, it is critical for Muslims to unite and give a united response to the hate-mongers. However, unfortunately, the reality is that the current Muslims are deeply divided even on those practices and beliefs that no one in the entire Muslim world has ever disputed for more than 13 centuries. Instead of focusing on the real issues of the Muslim Ummah we are wasting time and resources in countering each other on the issues which had never been issues. Every year in the month of Rabi Al Awwal, one of the most useless and misguiding campaign is carried out against the celebration of Eid Milad un Nabi (Peace be upon him) also called Mawlid– the birthday of Prophet Muhammad (peace be upon him). As Rabi-Al-Awwal approaches, the annual campaign of Fatawa and speeches against celebrating the Birth of Prophet Muhammad (Peace be upon him) starts. What a waste! The people who oppose celebrating the birthday of Prophet Muhammad (Peace be upon him) argue that it should not be celebrated because the Prophet himself and his companions after him did not celebrate his birthday. According to these opponents, celebrating the Prophet’s birthday is an innovation in Islam, and the Prophet (peace upon him) has forbidden creating innovations in Islam. An innovation in Islam is called Bid’a. In their opinion, the Prophet’s birthday was not celebrated by the Prophet and neither by his companions; therefore, it is an innovation (Bid’a) and must be avoided. For them it’s a sin. There is not a single verse in the Qur’an OR a Hadith of Prophet Muhammad (Peace be upon him) forbidding the celebration of Prophet’s birthday. However, those who oppose the birthday celebration of Prophet Muhammad (Peace be upon him) quote many verses from the holy Qur’an and Hadith giving an impression to the less knowledgeable Muslims that it is forbidden. They twist the meanings and insert their own biased opinions in Qur’an and Hadith. A few weeks ago, a brother gave me a fatwa handout against celebrating the birthday of Prophet Muhammad (Peace be upon him). He said, “there are several references from Qur’an and Hadith in the handout against Eid-Milad-un-Nabi”. When you read those fatawa and handouts, you will never find a single verse from Qur’an or a single Hadith in which Allah OR His Messenger (peace be upon him) forbade to celebrate the birth of the Prophet (peace be upon him). It is always a twisted interpretation of those verses from Qur’an and Hadith which are not even related to the topic. This is the deception, which ordinary Muslims do not understand. They just see the NUMBER of references made from Qur’an and Hadith not knowing that these references have nothing to do with Eid-Milad-un-Nabi (Birthday of Prophet Muhammad (Peace be upon him). The opponents of Eid-Milad-un-Nabi purposely misquote and misinterpret Qur’anic verses and the Hadith of Prophet (Peace be upon him) in order to misguide Muslims just like Qadyanis who twist the meanings and the interpretation of the verses of the holy Qur’an and the Hadith of Prophet Muhammad (peace be upon him) to justify the legitimacy of their false Prophet. What is Eid-Milad-un-Nabi / Mawlid? Eid-Milad-un-Nabi means birthday of Prophet (peace be upon him). The Muslim celebration of the birthday of Prophet Muhammad (peace be upon him) is quite different from the Christian Celebration of Christmas, the birthday of Jesus Christ (peace be upon him). What do Muslims do on the day of Eid Milad un Nabi (peace be upon him)? They organize gatherings in which Muslims discuss the birth, the life and the message of Prophet Muhammad (Peace be upon him). They feed the poor and the guests. They read the Qur’an and learn Qur’an from scholars. They praise Prophet Muhammad (peace be upon him) and sing Naat / Nasheed (poems / rhymes). They reach out to non-Muslims and inform them about Islam. The day is celebrated with purely religious and spiritual aspects of an Islamic life. At this occasion Muslims remind themselves to love and follow Allah’s last Messenger (Peace be upon him) in daily life. Eid Milad un Nabi (peace be upon him) is just like any other religious get-together of Muslims for the remembrance of Allah and His beloved Messenger (Peace be upon him). If a gathering that discusses the birth, the life (SEERAH) and the message of Prophet of Islam is a Bid’a (distortion in Islam) because the Prophet himself and his companions (Peace be upon them) did not organize or ask people to organize such gatherings then we should not be doing any thing in the name of Islam that was not done by the Prophet (peace be him) OR his companions (May Allah be pleased with them). Why Muslims organize and practice the following? The following practices and celebrations were never organized by Prophet Muhammad (Peace be upon him), neither by his noble companions and nor by any scholar in the history of Islam except until recently. However, Eid-Milad-un-Nabi (Sallallaho Alaihe Wasallam) has been in practice for the last thirteen centuries and has never been disputed by any scholar of Islam until the Zionists and the Crusaders occupied Muslim countries and made them colonies in 1800s/1900s. Eid Milad un Nabi has been made controversial during the last century. It had never been a controversial issue. Those who call Eid Milad un Nabi (Sallallaho Alaihe Wasallam) Bid’a let me share with you their BID’As. Why their actions and practices are not called Bid’a? Bid’a Number 1: The only worldwide gathering of Muslims commanded by Allah and practiced by Prophet Muhammad and his companions (Peace be upon them) is Hajj. There is NO other international (worldwide) gathering of Muslims in Islam. Where do you find a verse in Qur’an or a Hadith to organize worldwide gatherings of Muslims in the name of TABLEEGH? In Pakistan and Bangladesh the annual TBALIGHEE IJTIMA’ attracts more Muslims than Hajj. Isn’t this a Bid’a? When did the Prophet (Peace be upon him) OR his companions OR Muslim scholars organize the worldwide gatherings of Muslims in the name of Tableegh? Worldwide Tableeghi Ijtima was started few decades ago by the founder of the Tableeghi Jama’t in India, Maulana Ilyas Gujrati. But Eid Milad un Nabi has 13 hundred years of history. Just like Eid Milad un Nabi (peace be upon him), the Tableeghi Ijtima’ has a fixed annual date. People participate, pray and learn Islam in both gatherings. Why Tableeghi Ijtima is not a Bid’a but Eid Milad un Nabi is Bid’a? Bid’a Number 2: In Pakistan (1970s) former Prime Minister Zulfiqar Ali Bhutto invited the Imam of Ka’ba to visit Pakistan. When Imam Ka’ba, a fierce opponent of Eid-Milad-un-Nabi, came Pakistan Muslims abandoned mosques and prayed Friday prayers in large stadiums behind him. Was there any precedence in Islam for such gatherings? Prophet (peace upon him) and his companions (Peace be upon them) never did such a thing. Never happened before in the history of Muslims that Muslims emptied mosques and prayed behind an Imam because he came from Saudi Arabia? That was definitely a new thing. It was a big Bid’a? Why no Fatwa was issued against the Imam of Ka’ba and all those who prayed behind him. Bid’a Number 3: The scholars, Ulema and students of Dar-ul-Aloom Deoband (one of the oldest Islamic universities in India) celebrated the 100th anniversaries of the Dar Al Aloom Deoband. The 100th birthday of Dar-ul Aloom Deoband was celebrated under the leadership of a Hindu Prime Minister of India, Indira Gandhi. Did Prophet or his companions ever celebrate the anniversary of Masjid Al Quba, Masjid Al Nabawi, etc.? Talk about inviting a “Mushrikah” (pagan) to preside over the gathering of Ulema-e-Islam. Wasn’t that a Bid’a? It is obvious that the haters of Eid Milad un Nabi have more love and respect for their Dar Al Aloom and pagans than the birthday of Prophet of Islam (Peace be upon him). Bid’a Number 4: Few years ago in UK, the Ahl-e-Hadith party held TOWHEED-O-SUNNAT conference and invited Imam Ka’ba and many other scholars. They do this every year. Did Prophet Muhammad (peace be upon him) or his noble companions (Peace be upon them) ever organized a program called TOWHEED-O-SUNNAT Conference and traveled to speak at a conference? Why Towheed-o-Sunnat conference can not be declared Bid’a? The Salafis (self appointed Ahle Hadith) commit more Bid’a and deny more Hadith than any other sect within Islam. Bid’a Number 5: Whenever Muslims get upset on an issue or conflict, they take out processions and rallies to protest. Muslim leaders and scholars of Islam address those rallies. Among the organizers and the leaders of those rallies are those who consider Eid-Milad-un-Nabi Bid’a. I ask them a very simple question. Did Prophet Muhammad (peace be upon him), his companions OR the noble scholars of Islam ever took out rallies and banners protesting against an aggression or a conflict or an issue? Were there any rallies organized by Muslims when Al Quds was captured by Crusaders? Where is the basis of these rallies in Qur’an, Hadith and in the history of Islam? Aren’t these rallies Bid’a? The haters of Eid Milad un Nabi invite Muslims to attend their rallies. They say,” taking part in these rallies is Jihad and participants will be rewarded by Allah”. But if a rally to create awareness about our beloved Prophet (peace be upon him) is organized, it becomes Bid’a. What a shame! Bid’a Number 6: During 1970 elections in Pakistan Jamat Islami took out major processions in the name of Youm-e-Shawkat-e-Islam. This name itself undermines the religion of Islam. Everyday is Youm-e-Shawkat-e-Islam not when Jamat Islami contests elections. When did the Prophet and his companions organize Youm-e-Shawkat-e-Islam? Wasn’t that Bid’a? Did anybody issue Fatwa against those large processions? They were all done in the name of Islam. People were expected to get rewards from Allah for their contribution and participation. But participation in the procession of Eid Milad un Nabi (Peace be upon him) is called Bid’a? No wonder the followers of Abdullah Ibn Obai do exist in our times too. Bid’a Number 7: Saudi Arabia does celebrate Youm-ul-Watani (National Day of Saudi Arabia). Television stations telecast special programs and newspapers print special editions and private companies give their employees a day off. I have never seen any Saudi scholar’s fatwa against the celebration of Saudi National Day. But they are very quick in giving Fatwa against Eid-e-Milad-un-Nabi. Did Prophet (Peace be upon him) OR his companions (May Allah be pleased with them) ever celebrated the establishment of the Islamic state of Madinah? Saudi scholars, who oppose the celebration of Prophet’s birthday, gave Fatwa for justifying US troops in Saudi Arabia but they can not issue a Fatwa against the Bid’a that is committed by their own government and by them. That is a real distortion of Islam. Bid’a Number 8: In North America, ISNA, ICNA, CAIR and many other Muslim organizations organize their annual conventions. In most cases people have to purchase tickets to listen to the speeches of various scholars. Isn’t this entire setup a Bid’a? When did Prophet (Peace be upon him) OR his companions (Peace be upon them) OR scholars of Islam after them organize such conventions? Why people have to pay in order to listen to the speeches of the scholars of Islam? Where is the basis for this? Did Prophet (Peace be upon him) charge fee for his speeches? Any companion of the Prophet ever asked people to pay for a good cause first before he would deliver his speech? Off course not. Those noble people never did such things but it’s OK for the opponents of Eid Milad un Nabi. Indeed, it’s a major Bid’a but they won’t call it Bid’a; otherwise, they have to close their shops. Bid’a Number 9: The very concept of forming organizations such as Jama’t Ahl-e-Hadith, Party of Salafis, Jama’t Islami, WAMY, Rabita Aalm-e-Islami, ISNA, ICNA, CAIR is a Bid’a. Neither Prophet nor his companions (Peace be upon them) ever formed organizations and named them. The only name for worldwide Muslim body is “Muslims”. Only Allah divides people into tribes and nations for identification. These opponents of Eid Milad un Nabi (Sallallaho Alaihe Wasallam) have divided the Ummah. What a worse Bid’a they have committed? Bid’a Number 10: A Pakistani woman who has now moved to Canada but still operates in Pakistan considers herself a scholar of Islam. She gives fatawa not only against Eid-Milad-un-Nabi but against many other Islamic traditions such as Qur’an reading in congregation (Qur’an Khawani), etc.. She organizes prayer get-togethers for woman only. She organizes Salat-at-Tasbeeh get-together for women only. She organizes Taraweeh prayers for women only. She has invented many things in Islam for the sake of women but for her Eid-Milad-un-Nabi is Bid’a? Where she finds basis for her style of preaching Islam? She organizes gatherings of women against the teachings of Prophet Muhammad (Peace be upon him), which is a worse form of Bid’a. She has destroyed many families in the name of Islam. She has converted many Muslim women into fanatics. Her entire organization is a Bid’a. Bid’a Number 11: Today, in North America Muslim associations organize fundraising dinners for mosques, Islamic schools or for humanitarian purposes. They sell tickets and invite speakers. When Prophet or his companions (Peace be upon them) raised funds through fundraising dinners? When Prophet or his companions (Peace be upon them) sold $5, $25, $100, etc. food plates for a good cause. Isn’t this all Bid’a? They organize these fundraising dinners which benefits them but the celebration of Eid Milad un Nabi (peace be upon him) hurts them. Wow! If celebrating the birthday of Prophet (peace upon him) is an innovation (Bid’a) because neither Prophet (peace upon him), nor his companions ever celebrated Prophet’s birthday, then why the following Bid’a (innovations) were created centuries ago and why everybody practices them today? Why the opponents of Eid Milad un Nabi (peace upon him) do not condemn them and stop practicing them immediately. Bid’a Number 12: When Qur’an was revealed to Prophet Muhammad (peace be upon him) , it did not have thirty volumes. Neither Prophet Muhammad (peace be upon him) nor his noble companions divided Qur’an into thirty volumes (siparah). Qur’an was divided into thirty volumes by the rulers and the scholars hundreds of years later for the convenience of HUFFAAZ (memorizers of the holy Qur’an). It helped HUFFAAZ in managing the recitation of the holy Qur’an in Taraweeh prayers in Ramadan. Bid’a Number 13: Neither Prophet (peace be upon him) nor his noble companions ever put Rukoo and their numbers in the holy Qur’an. These Rukoo were added in Qur’an by the rulers and the scholars hundreds of years later to help Imams and HUFFAAZ in memorizing the verses of the Qur’an and provide better organization and management for reading Qur’an in regular daily prayers and Taraweeh prayers of Ramadan. Bid’a Number 14: During the time of Prophet (peace be upon him) there were no A’RAAB (Fatha/Kasrah/Dhamma / Zabar Zer Pesh) in the holy Qur’an. These were added in Qur’an by the command of a very ruthless and cruel Muslim ruler, Hajjaj Bin Yousuf. The A’RAAB were inserted in the Qur’an in order to help non-Arabs to read Qur’an correctly. Today, Arabs and non-Arabs both depend on these A’RAAB in order to read Qur’an correctly. These A’RAAB were an innovation. But if this innovation is removed from the Qur’an, the opponents of Eid Milad un Nabi (peace be upon him) would not be able to read Qur’an correctly. They need this innovation but not Eid Milad un Nabi (peace be upon him). Bid’a Number 15: In Islam, for a Muslim, moving to a non-Muslim country from a Muslim country is allowed in three situations only. 1) When a Muslim is persecuted in his/her own Muslim country and facing dangers to his/her life. 2) When a Muslim wants to preach Islam in a non-Muslim country. In other words, you have to be a Muslim Missionary in order to settle in a non-Muslim country. 3) When a Muslim wants to get education which is not available in a Muslim country. Islam does not allow Muslims to leave Muslim countries and settle in non-Muslim countries except under the above mentioned three conditions. Neither Prophet (peace be upon him), nor any companion of Prophet (peace be upon him) migrated to non-Muslim countries for “better economic opportunities”. They migrated to non-Muslim countries under the above mentioned three situations ONLY. However, one of the most widespread and desirable Bid’a committed by the opponents of Eid Milad un Nabi (peace be upon him) is to find better life in the non-Muslim countries. In fact, the immigration to non-Muslim countries by the Muslims is so desirable and desperate Bid’a that Muslims pray to Allah to help them in committing this Bid’a. Allah knows very well the hypocrites. One of the biggest misconceptions of our time is that the Muslims look at the Imams and the clergy of Makkah and Madinah as the true and correct scholars of Islam. They believe whatever the Imams of Masjid Al Haraam and Masjid Al Nabawi Sharif say, “can not be wrong”. They are the Imams of the Holiest Mosques in the entire world. Since these Imams do call Eid Milad un Nabi (Peace be upon him) a Bid’a; therefore, it must be a Bid’a. The Mufti of Saudi Arabia must be the most knowledgeable scholar. His Fatwa should be the most authentic. If this is the standard then let me draw your attention towards history. Ottomans (Sultanat-e-Usmania) ruled Makkah and Madinah and the most of the Muslim world for seven centuries. For seven centuries the Imams of Masjid Al Haraam and Masjid Al Nabawi Sharif used to organize, celebrate and lead the celebrations of Eid Milad un Nabi (peace be upon him). Eid Milad un Nabi has always been celebrated throughout the Arabian peninsula before becoming Saudi Arabia including Masjid Al Haraam and Masjid Al Nabawi Sharif. In fact, the largest gathering of Eid Milad un Nabi (Sallallaho Alaihe Wasallam) used to be held in Masjid Al Haraam in Makkah. This practice was stopped after the WAHABI revolution in Saudi Arabia. If you would have been born during the Ottoman Empire, you would have seen the biggest celebration of Milad Sharif in Haram Al Makki and Madani. We MUST not change our traditions if the governments change. Our traditions are based upon the holy Qur’an, the noble Sunnah of our Prophet (Peace be upon him) and the “Ijma” (consensus) of scholars of Islam. If the government in Saudi Arabia changes today then what happens to the opponents of Eid Milad un Nabi? Will they start celebrating? Eid Milad un Nabi unites Muslims and the denial of Eid Milad un Nabi divides Muslims. The proof is in the 1300 years of Muslim history. When Muslims were together in celebrating the noble birthday of Prophet Muhammad (Peace be upon him), they were all united but when they started debating the permissibility of Eid Milad un Nabi, they got divided. It is not the celebration of Eid Milad un Nabi that divides Muslims. It is the denial of the Eid Milad un Nabi that divides Muslims. One of the most deceiving arguments presented by the opponents of Eid Milad un Nabi (Sallallaho Alaihe Wasallam) is that the National Days, formation of organizations and contesting elections are the matters of this world (Dunya). They are not part of the Sharia of Islam but those who celebrate the birthday of Prophet Muhammad (peace be upon him) they do it as a part of Islam and the Islamic Sharia. Therefore, Eid Milad un Nabi is Bid’a because Prophet did not make it a part of Islam. What a strange, deceiving and un-Islamic argument is this? Holy Qur’an says; O believers enter into Islam completely and do not follow the footsteps of Shaitan, surely he is your clear-cut enemy. (Surah Al-Baqara, Ayah 208). It means for a believer there is not a single moment in life that can be outside of Islam OR Islamic Shari’a. We Muslim believe that all actions of a believer such as work, family time, sitting with friends, husband-wife relationships, sleeping, even exercising and playing are all part of Ibadah (worshipping of Allah) as long as the believer does it for the sake of Allah. Qur’an says, “Say: Surely my prayer and my sacrifice and my life and my death are (all) for Allah, the Lord of the worlds” (The Cattle 6.162). It means for a Muslim every worldly or non-worldly deed must be for Allah. Does this mean that when the haters of Eid Milad un Nabi carryout their “worldly deeds” they do it for their sake, not for Allah. They do not remain in Islam when they do “worldly” things because it will be encompassed by the Shari’a and they don’t want it to be seen as a part of Shari’a. I do not think that they believe this. Therefore, the above mentioned all Bid’as of the opponents of Eid Milad un Nabi (Peace be upon him) are done for the sake of Allah. Therefore, they see their practices (which are in fact Bid’a) as SHAR’EE (legitimate). Then why Eid Milad un Nabi can not be considered SHAR’EE (legitimate)? If every innovation (Bid’a) would have been a sin in Islam then Ameer ul Mo’mineen, Sayyidna Umar Ibn Al Khattab would have NEVER used the word “Ni’matul Bid’a” (beautiful innovation) for the Taraweeh prayers in congregation. The Wahabi revolution was one of the major causes for the fall of Khilafah Al-Islamiyah. In the entire Muslim world Saudi Arabia is the only country where Eid–Milad-un-Nabi has been officially stopped. However, millions of Saudis do celebrate Eid Milad un Nabi (peace be upon him) inside their homes due to the fear of persecution from the Mutawwas (the Wahabi civil militia). If you look at the beliefs and practices of KHAWARIJ who killed thousands of companions and the Ahlul Bait of Prophet Muhammad (peace be upon him), you will find a very close resemblance between the KHAWARIJ and the opponents of Eid Milad un Nabi (peace be upon him). Please read the Travel Story of Ibn-e-Batuta (Safar Nama Ibn Batutah) . He has described the eye-witnessed celebration of Prophet’s Birthday in Makkah inside the Haram and the city. Ibn-e-Batuta was just a traveler. He wrote what he saw in Makkah. We must not pay attention towards the FITNAH created by the misguided and fanatics. Let’s go back to the Islamic traditions – the traditions practiced by all Muslims except the people who became the agents of Zionists and Crusaders. I request all of you to celebrate the Birthday of Prophet Muhammad (Peace be upon him) with utmost enthusiasm and devotion. WE MUST SHOW THE WORLD THAT WE LOVE MUHAMMAD (PEACE BE UPON HIM) MORE THAN OUR OWN PARENTS, OUR OWN CHILDREN AND OUR OWN LIVES. Let’s make a commitment on the Birthday of our HABEEB (Sallallaho Alaihe Wasallam) that we will follow his teachings for the rest of the year and during the remaining period of our lives. We will pray five prayers because Prophet Muhammad (peace be upon him) loved to perform the daily five prayers. We will do what he liked and we will stay away from what he (Peace be upon him) forbade. Please let us know if ISCC can help you in organizing the gatherings of Milad Sharif in your area. All ISCC services are FREE. Contact@islamicsupremecouncil.com. 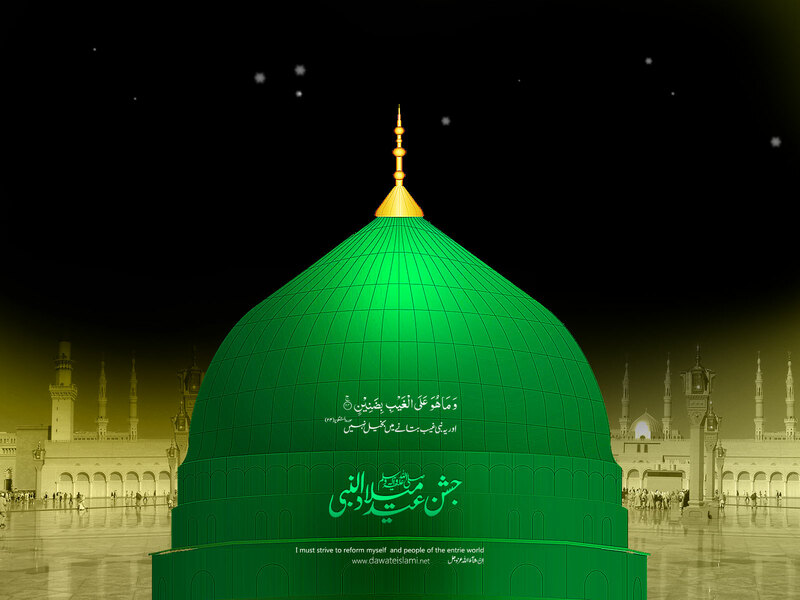 Eid Milad un Nabi (Peace be upon him) MUBARAK. 52|33|Or do they say, “He made it up”? Rather, they do not believe.